Even as President Clinton was hailing an outbreak of peace in the region, Chairman of the Joint Chiefs of Staff General John Shalikashvili – now a director at Carlyle Group – was meeting with Croat military commanders in Zaghreb to coordinate the deployment of 25,000 US troops to back the breakaway armies in Croatia and Bosnia-Herzegovina. 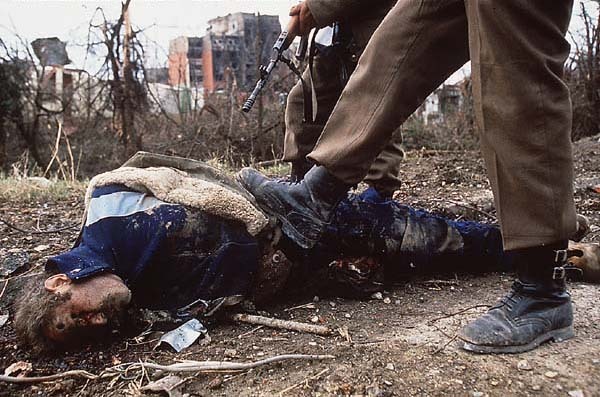 Islamic fundamentalists poured into Bosnia. They were trained by ex-Afghan mujahadeen leaders, including Osama bin Laden. Iranian mullahs were also sending fighters, with blessings from the Clinton Administration. Bin Laden’s al Qaeda operatives trained a cell of Bosnian fighters known as Takfir wal Hijra (Expiration and Exile). Some in the Clinton State Department were nervous about the growing ranks of Islamists in Bosnia, but CIA argued against the expulsion of al-Qaeda. They even arranged to have certain terrorist groups deleted from a State Department watch list so that members could travel freely to the Balkans to take part in the war. Some in the Clinton State Department were nervous about the growing ranks of Islamists inBosnia, but CIA argued against the expulsion of al-Qaeda. They even arranged to have certain terrorist groups deleted from a State Department watch list so that members could travel freely to the Balkans to take part in the war. Suddenly the US corporate media sounded a less than sympathetic tone towards the Bosnian Muslims, who a few years earlier had been electronically engineered to bring tears to the eyes of every American household. Thousands of Bosnian Serbs gathered daily in the Sarajevo suburb of Ilijas to protest the handing over of predominantly Serb suburbs of the city to the Muslim/Croat Federation via the Dayton Accords. French General Jean-Rene Bachelet, who commanded UN troops in Sarajevo, termed the deal “ethnic cleansing”, the phrase which the US used against the Serbs throughout the war. Bachelet initially refused to have his troops enforce the Dayton Accord provisions, but eventually bowed under pressure from Paris. Pale aired another program titled Genocide, which documented al Qaeda terror against Serbs and featured Borvivoje Sendic, Deputy Chair of the Serb Democratic Party, who commented of the upcoming Yugoslav elections, “The international community will try to intervene in the forthcoming elections. But the Serbs will not allow themselves to be cheated this time out of respect for all the victims who have fallen…” Mirjana Markovic, wife of President Milosevic and head of the United Left Party, which is allied with her husband’s Socialist Party, said in 1996 that protestors in Belgrade were fomenting civil war, many carrying US and German flags. Markovic denounced both nations as “dark powers” behind the tumult. Milosevic, who was re-elected head of the Socialist Party in November 2000 carrying 86.55% of the vote, was handed over to the War Crimes Tribunal in return for an IMF aid package to the new Belgrade government. Milosevic was defiant in The Hague, saying he didn’t have to answer questions because the court had no legitimacy or jurisdiction. He called the Tribunal “the new Gestapo in the Hague”, and said “genocide had been carried out against the Serbs by part of the international community”. Yugoslav children had their own way of protesting the hijacking of their country. At Peter Petrovic Nyegos primary school students were asked to lend their artistic talents to help summarize the war being waged on their country. One child drew a picture of a fat American prostitute walking a little dog named “Europe”, another portrayed the Ku Klux Klan lynching Serb soldiers, while a third depicted UNICEF airplanes bombing Serb children. Brown & Root was paid $546 million to build latrines, barracks and other infrastructure necessary to maintain NATO and UN troops occupying Yugoslavia. Three years later the company was paid another $400 million for logistical support in Bosnia, Croatia and Hungary, where a Brown & Root subsidiary known as International American Products provided troop support. Its Hungarian kitchen workers accused US troops who frequented their workplace of constant sexual harassment and exploitation. In 1996 US Commerce Secretary Mickey Kantor arrived in Zaghreb with representatives of 18 US multinationals. Kantor and his entourage negotiated an investment agreement to rebuild Croatia that would be a boon to the companies. Bechtel, never remiss to sniff out a government contract, got two to build power plants from the government of Croatia. Much of the Bosnian reconstruction effort was headed by the 353rd Civil Affairs Command, a Bronx Army Reserve Unit with big-time connections to corporate America. The unit was headed by US Army Colonel Michael Hess, who frequented the brand new World Bank office set up in Sarajevo. In 2000, the year Cheney stepped down to become the running mate of candidate Bush Jr., Brown & Root was awarded a $300 million contract by the US Navy to improve overseas bases, a $100 million contract to improve US Embassy security around the world and a $40 million contract to maintain the National Institutes of Health. Cheney received a whopping $20 million retirement package from Halliburton. The CIA had completed its partition of most of Yugoslavia and the agents of international capital were taking over. Problem was, Yugoslavia still controlled Stari Trg mine, massive coal reserves and the Adriatic oilfields which Big Oil coveted. Gaining those assets would require the severing of one more chunk of territory from the unruly Belgrade central government.